Simon Eardley is the Conservative candidate for the Saughall & Mollington Ward. "I am delighted to have the opportunity to put myself forward to be the candidate in the Saughall and Mollington Ward next May. In doing so I pay tribute to Cllr. Brian Crowe who has served this area and Chester as a whole with distinction for many years. He will be a hard act to follow! Politics is often quite low key in rural wards like this so my priority will be to meet, engage with and support as many of you as local residents to the best of my ability. Being a parish councillor, I know how important village based activities and initiatives are. 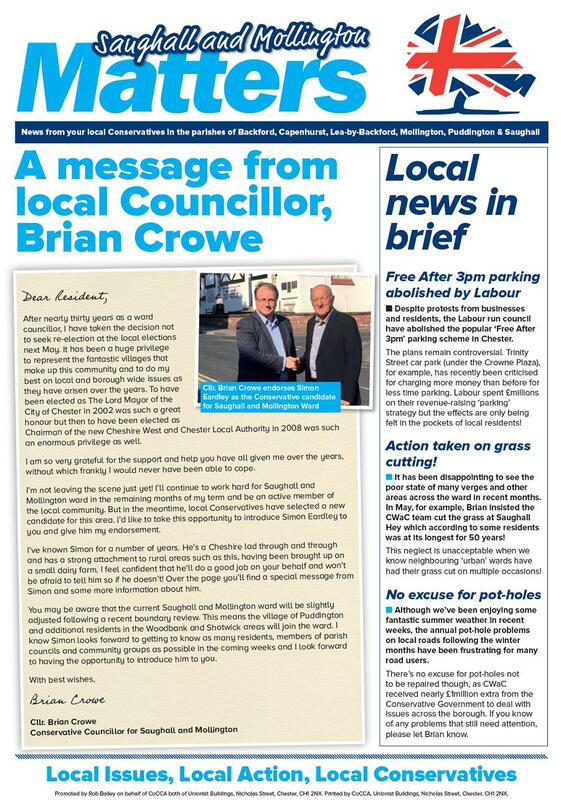 As part of the parish council team on which I serve, I’m proud of the positive contribution I’ve made to how the parish council is run and the projects we’ve delivered for the benefit of the local community. I believe this work gives me a strong foundation for being an effective borough councillor, which with your support I hope will be possible. Keep you up to date with positive action for the villages of this ward. I look forward to meeting many of you in the coming months as we embark on a local community survey throughout the villages. In the meantime, please do not hesitate to contact me or Brian if we can be of any help." Good news: new bus service for Mollington village! Local bus operator, Stagecoach, have been persuaded to provide a limited bus service between Mollington and Chester beginning the week commencing 2nd September 2018. 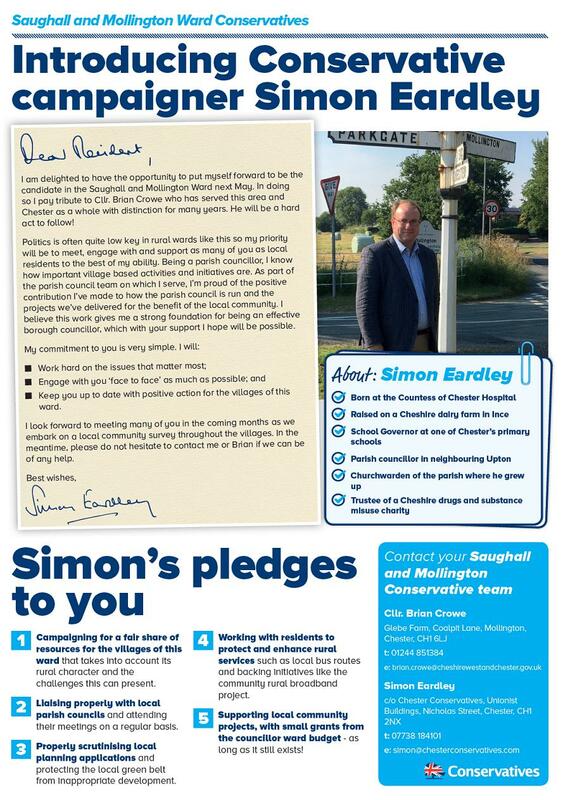 Conservative candidate Simon Eardley has set out his local priorities for the Saughall & Mollington Ward. 1. Campaigning for a fair share of resources for the villages of the ward that takes into account its rural character and the challenges this can present. Despite protests from businesses and residents, the Labour run council have abolished the popular ‘Free After 3pm’ parking scheme in Chester. Councillor Brian Crowe has endorsed local campaigner Simon Eardley to replace him as Councillor in the ward. Councillor Crowe's term of office comes to an end in May 2019. Would you like 'hyper-'fast broadband for your home or business? Conservative campaigner for Saughall and Mollington Ward, Simon Eardley, attended the B4RN Cheshire public meeting at the Gordale Garden Centre earlier this week. B4RN is a community project aiming to bring fast (1000Mbps) full fibre broadband to a number of villages in the ward.